Rustin Gudim/The Aspen TimesSkiers freshman Clayton Crawford goes up for a shot as teammate Jake Nugent looks on during Friday's game against Roaring Fork at Aspen High School. On a night when their flu-stricken star went scoreless and they were locked in a seesaw battle with 3A Western Slope foe Roaring Fork, the Skiers were in desperate need of a spark. Guard Quinn Morehead provided it – and then some. 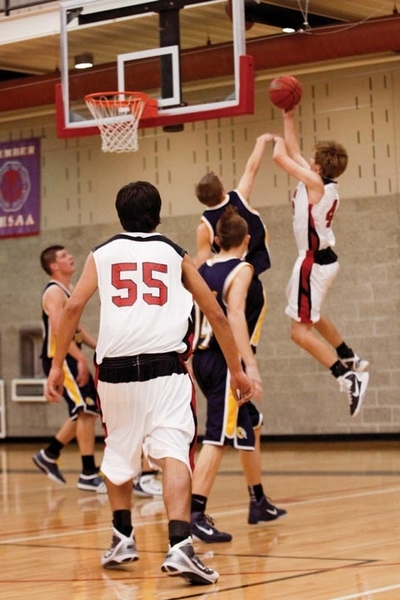 The junior scored 23 points, including 11 in two overtime periods, to help Aspen escape with a dramatic 56-53 victory. Morehead had just five points after two quarters but, when his team needed him most, he came up with one big shot after another. With junior forward Jake Nugent relegated to the bench after fouling out and Bridger Dawson struggling through his worst offensive night of the season, Morehead repeatedly called his own number in overtime. In the first extra period, he put his team ahead with an early 3 from the top of the key. Later, after Roaring Fork pulled ahead, he converted once more from long range to square the game at 47, bringing the raucous crowd to its feet. About 30 seconds later, Skiers freshman Clayton Crawford pulled down an offensive rebound and scored with 29 seconds to play, prompting a Rams timeout. Roaring Fork produced an answer. Guard Dalton Handy found a seam, attacked, then pulled up and nailed an off-balance jumper in the lane with 9 seconds remaining. The Rams struck first in the second extra period when Trae Moxley backed down his defender and scored off the glass. Morehead had a few more heroics left, however. He answered right back by rolling off a screen, controlling a pass and launching another 3 that found the bottom of the net. Later, following two free throws from teammate Mike Schwartz and a basket from Roaring Fork’s Sam Carpenter, Morehead stepped to the line after being fouled with 42 seconds on the clock. His first attempt rattled around the rim but fell through. The second extended the Skiers’ lead to three. “He came through with some big, big shots, something he wasn’t doing early in the season,” Aspen head coach Steve Ketchum said. “We needed every one of his points. And nerve-wracking. After a missed Rams shot, Dawson was fouled with 22 seconds to play and stepped to the line with a chance to give the Skiers a two-possession lead. Instead, he missed the front end of a one-and-one, giving the visitors life. Roaring Fork guard Dakotah Grett got off two shots before the buzzer sounded but could not connect. Morehead and Schwartz, who pitched in with 14, scored early in the third quarter to give Aspen what appeared to be a comfortable 23-12 advantage. Undaunted, the Rams (9-7 overall, 6-4 conference) reeled off 11 straight points to square things at 23. In the fourth, they squandered two late opportunities to secure a win. Carpenter missed a wide-open lay-up with 47 seconds remaining in regulation that would’ve put his team ahead by four. Instead, Schwartz found himself all alone under the basket for an easy lay-in on the ensuing Skiers possession. With about 10 seconds to play, Handy faked a 3, then attempted to feed teammate Jake Strack-Loertscher in the post; Strack-Loertscher did not expect the pass, and the ball sailed out of bounds. Aspen (10-7, 7-4) could not produce the game winner in regulation, as Morehead had a pass stolen seconds before the buzzer sounded. He redeemed himself soon after, however, helping the Skiers secure a fourth consecutive win. They’ll look to keep that streak going Tuesday, when they host Basalt at 7 p.m. Without standout Bailey Everhart in the lineup Thursday, Aspen could muster just 28 points in an effective if not impressive victory over West Grand. The junior returned from a concussion Friday, and the Skiers looked like a completely different team. They raced out to an 18-5 lead after one quarter, withstood a Roaring Fork rally in the third quarter and cruised to a 51-39 victory, improving to 5-12. Everhart led all scorers with 18 points. Everhart scored just two points in the opening quarter Friday, but she helped spread the court and generate scores of open looks for her teammates. Anna Stevens was among those who took advantage, scoring all eight of her points in the first eight minutes. The Skiers led, 29-21, at the half. But, much like Thursday, they let their opponent climb back into the game early in the third. Roaring Fork shook free for two easy baskets in the opening minutes of the third, then Hattie Gianinetti converted a long jumper from the top of the key to cut her squad’s deficit to three at 30-27. The winless Rams would get no closer. Everhart answered with a spinning runner in the lane, sparking a 13-4 Aspen run to close the third. The Skiers were never tested down the stretch. Aspen hosts Basalt at 5:30 p.m. Tuesday.